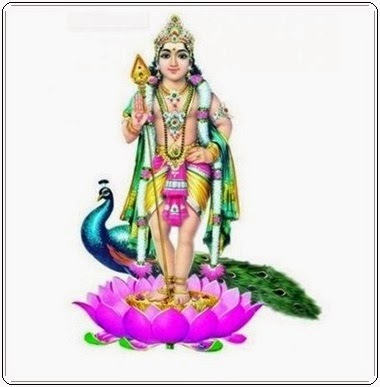 Lord Kartikeya or Muruga is one of the most worshiped Gods in South India, especially Tamilnadu. He is the son of Lord Shiva and Parvati. Kartikeya is considered as an avatar of Lord Shiva. As per the Legend he was born of the six rays of light that emerged from the third eye of Lord Shiva. The six rays fell on the forest of reed grass and was carried to the Ganges by Vayu and Agni which turned to six beautiful babies on six lotus flowers. The six babies were united into one with six faces and twelve hands when Parvati held them in her arms. His avatar was to put an end to Soorapadman’s cruelty. Lord Muruga is worshiped on the 6 day after Diwali on an occasion called ‘Skanta Sashti’ making the victory over the demons Tarakasura and Surapadman. It is believed that if one worships Lord Muruga on Friday and fasts on that day all his wishes will get fulfilled.